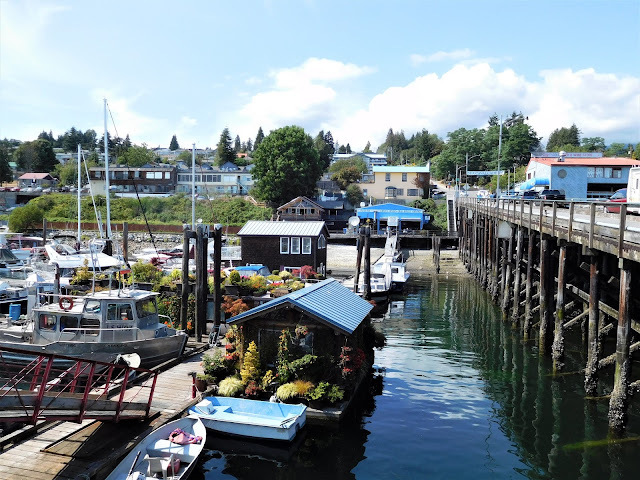 Returning to Anacortes, Washington from a summer of cruising meant starting the mode of heads-down to edit, write, and organize all the updates, photos and reference maps in preparation of producing the 2019 edition of the Waggoner Cruising Guide. Literally hundreds of updates were collected thanks to the enthusiastic work of our volunteer Field Correspondents along with Editors Mark, Lorena and Leonard, all of whom spent the summer cruising the Pacific Northwest, researching the many marinas and anchorages found in the Waggoner Cruising Guide. Field Correspondents were formally organized for the 2018 cruising season and have been an integral part of our data gathering process. Boaters can look forward to finding many important updates in each chapter of the Waggoner Guide, along with new and updated reference maps in the 2019 edition. 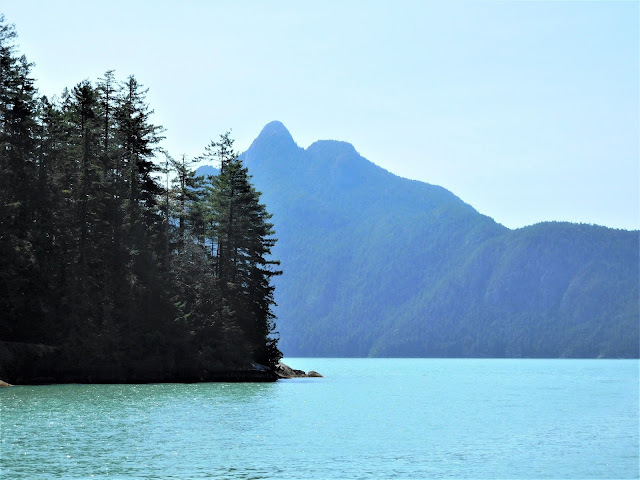 New anchorages have been added to West Coast Vancouver Island and Haida Gwaii chapters along with re-writes for new material. 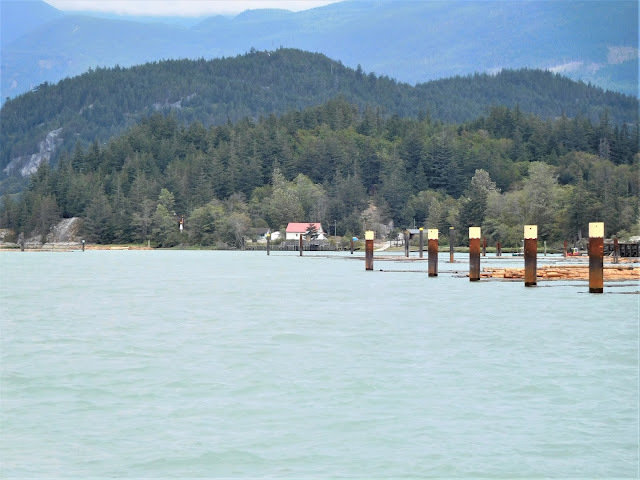 Customs procedures are changing in in 2019, another important addition for our readers, and you won't want to miss reading about the new public mooring buoys at Cowichan Bay. Readers will also find more information in the front section (chapter 1) that help boaters prepare for their cruise, including reference material covering weather, fishing permits and cruising permits. You might be asking, what’s the new theme for 2019? The 2018 theme of ‘Early Maritime Explorers of the Pacific Northwest,’ proved to be well received along with other improvements made to the Waggoner Guide, resulting in record sales. Likewise, we think you will enjoy ‘Nautical Tales through the Eyes of the Past,’ our chosen theme for 2019. How many of us have wondered what took place on an island, or village in earlier times? Learning something about the history of the places we visit, brings a whole new appreciation and perspective for our many cherished boating destinations. You won't want to miss the 2019 edition containing synopsis of 15 non-fiction books that are both fascinating and enlightening, you might even hear yourself say, “I didn’t know that!” Speaking of history, 2019 is the 25th Anniversary of the Waggoner Cruising Guide, which has provided the most concise and comprehensive information for boaters cruising the Pacific Northwest for the past 25 years. The Waggoner name is taken in honor of the "Waggoners" of the late 1500's. Dutch pilot, Lucas Waghenaer, published a volume of principles, charts, and sailing directions in Dutch, German, Latin, and English, used by sailors of the time. The modern-day Waggoner, updated each year, carries on the tradition of valuable information and resources for today's mariners. We think you’ll love the 2019 edition and look forward to seeing you at the Seattle Boat Show, starting January 25, 2019. We spent a week in the beautiful city of Vancouver BC catching up on some work and taking the time to go out on the town. Boating friends, Knut and Christine, met up with us for a couple of days, and previous neighbors from Eugene, Oregon happened to be in Vancouver and stopped by our boat to say hello. Our nephew, John, arrived the following day and joined us aboard Got d’Fever to spend some time with us touring this incredible city. Vancouver has so much to offer that one could spend an entire season here and not run out of things to see and do. 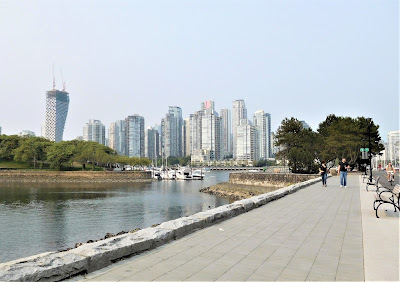 The best part, you don’t need a car to get around, thanks to the efficient public transportation which includes buses, the Sky Train subway, and water taxis. Bicycles really come in handy, as the entire city is linked with bicycle paths that interconnect with all the waterfronts, bordered with lovely parks, beaches, marinas and cafes. You would have to work hard not to have fun in this cosmopolitan city. 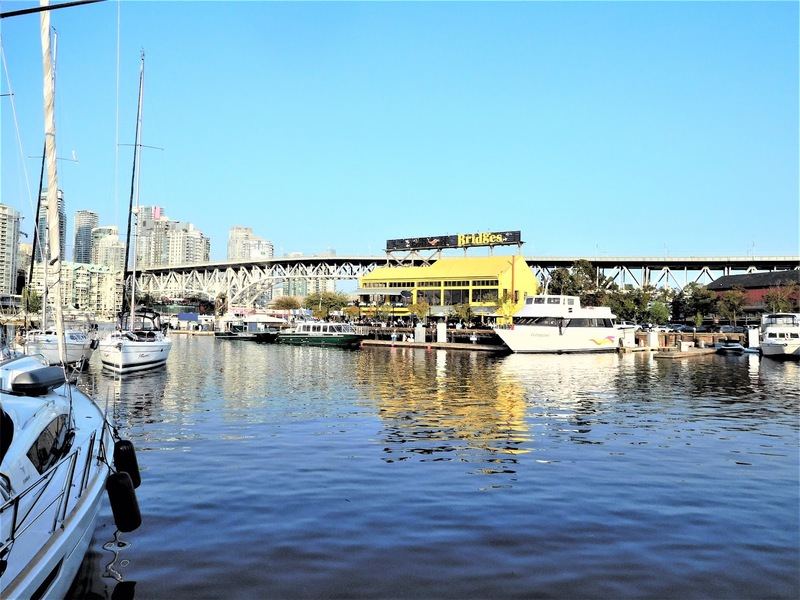 Last year we moored the boat at Quayside Marina on the north shore of False Creek; this year we moored our boat at Fishermen’s Wharf, just west of Granville Island. It’s a short walk from Fishermen’s Wharf to the excellent indoor Farmers Market, shops and cafes on Grandville Island, the perfect place to pick up some great produce for the galley, along with artisan breads and baked goods. There are several theatres with stage performances on Granville Island, including the Improv Centre, which we enjoyed with John. 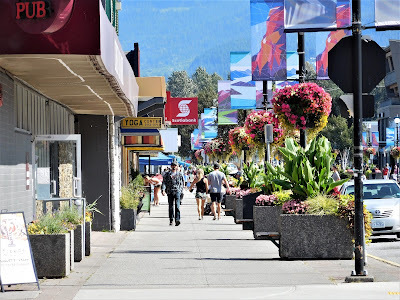 Fishermen’s Wharf is also within bicycling or walking distance of Vanier Park, located northwest of the wharf in the Kitsilano district of town, home to the Maritime Museum and the Museum of Vancouver. From early June to mid-September, the Shakespeare Festival, called “Bard on the Beach,” is held under the tents in Vanier Park. It’s best to reserve tickets ahead of time for this popular event. 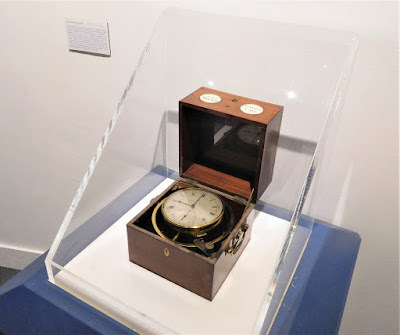 Serious boaters will appreciate the Maritime Museum, showcasing the Arnold 176 Chronometer used by Captain George Vancouver during his 5-year voyage of the Pacific. The chronometer was made prior to 1787 by John Arnold of London, who numbered all of his time pieces. These time pieces helped the navigator plot longitude. If the chronometer ran too fast or too slow, calculations would be in error so ships often carried several chronometers. Also on display is the lead line, sextant, and telescope used by Lieutenant Joseph Baker, who sailed with George Vancouver. The lead line helped sailors learn how deep the water was and if the bottom was sand, gravel, or mud. Knots or tags on the line were counted as the line slipped through the hands, thus measuring the bottom depth; a fathom equals about two meters or six feet. A sextant measures the angular distances between two visible objects such as the sun and the horizon to determine latitude. 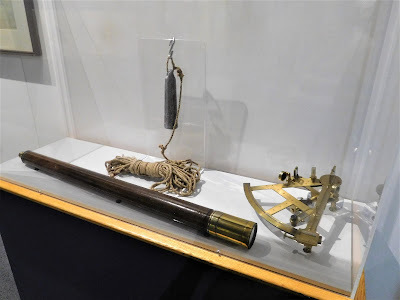 A sextant can also be used to measure the lunar distance between the moon and another celestial object (a star or planet) in order to determine Greenwich Mean Time and hence longitude. The sextant, used by Lieutenant Baker, had five eyepieces. The operator needed to make several adjustments using the index glass and the horizon glass; clear weather was important when making these observations. Joseph Baker owned his own telescope; and while looking through his eyepiece, he spied a conspicuous mountain above the clouds. Captain Vancouver credited his lieutenant by naming the mountain, Mount Baker. 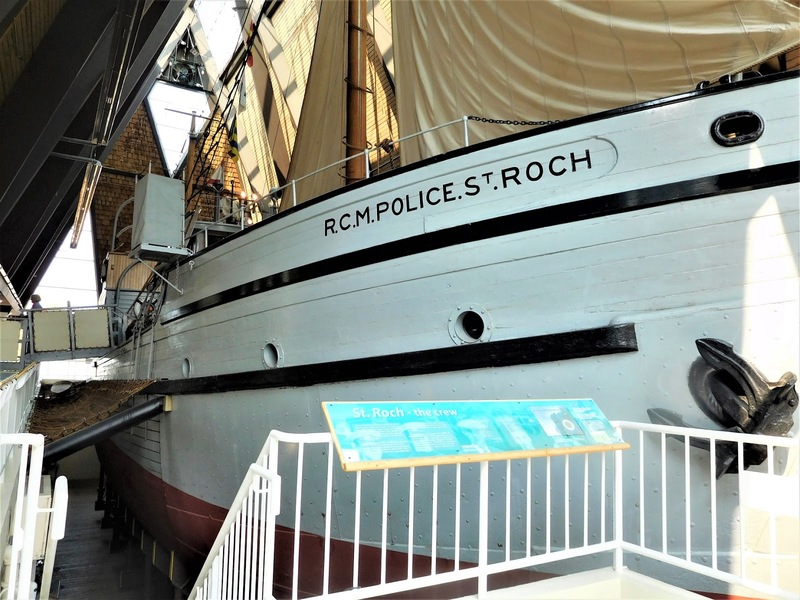 Another highlight of the museum is the refurbished 1927 St Roch, built at Burrard Dry Dock Co. of Vancouver, for the Royal Canadian Mounted Police. The ship was used as a patrol and supply ship in the western Arctic for more than 20 years. Each year, the RCMP sailed St Roch from Vancouver, loaded with supplies destined for the western Artic. The ship often remained in the Arctic for the winter, frozen in the sea ice. The long winters were spent patrolling the surrounding communities by dogsled. The saucer-shaped hull allowed the ice floes to slide under the ship rather than crushing it. Three ice beams located in the cargo hold also braced the hull against ice pressure. During WWII, the St Roch was asked to establish Canadian sovereignty in the Arctic. Sgt. Henry Larsen, who had commanded the ship since 1928, was ordered to sail from Vancouver to Halifax by way of the Northwest Passage. The trip took 28 months, including two winters spent in the ice. 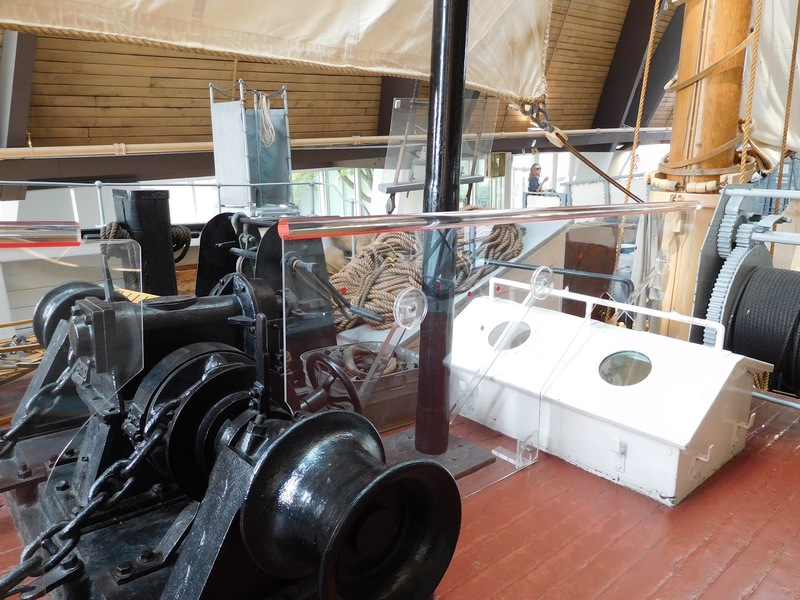 While in Halifax, a number of modifications were made to the ship, including the installation of a new 300 horsepower diesel engine. St Roch returned to Vancouver in the summer of 1944 by taking a more northerly route through the Northwest Passage. The crew of 11 made the 11,672 km (7,295 mile) trip in only 86 days. St Roch became the first ship to conquer the Northwest Passage in a single season, the first ship to travel the northern deep-water route and the first ship to sail the Northwest Passage in both directions. St Roch was decommissioned in 1954 and purchased by the City of Vancouver; the museum building was built specially to house her, including her mast and sails. The Maritime Museum is only one of many museums and attractions in Vancouver; there are too many to list here. Yaletown with the impressive BC Place Stadium and other architecturally pleasing buildings, including Concord Pacific, a condominium complex, currently being constructed. 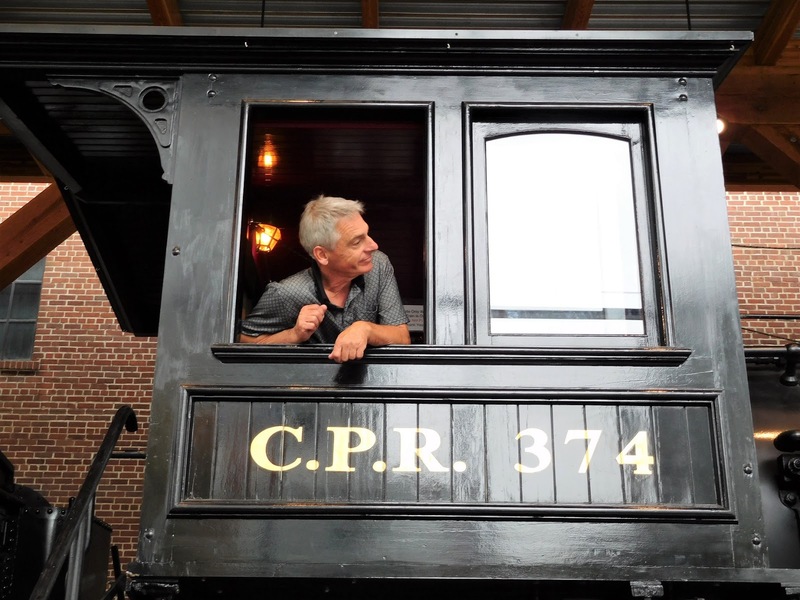 Yaletown is also home to the historic Roundhouse, the C.P.R. 374 Train Engine, and the loading docks, which now house shops and cafes. 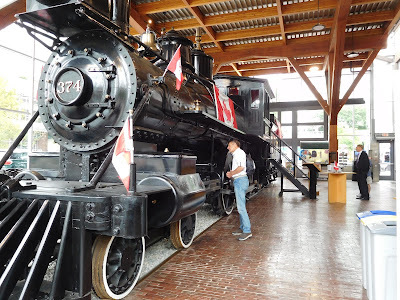 Steam Engine 374 pulled the first passenger train, carrying 150 people beyond Port Moody, finally joining Canada from the East Coast to Vancouver in the West; it was May 1887, and the event was the culmination of ten years of rail construction across the country. In 1914 the engine was selected for a rebuild, using the main frame of the original 1886 locomotive. After many years of service, including the second world war, Engine 374 was finally retired in July, 1945. The Roundhouse was converted into a local community center, giving the building and land to the Vancouver Park Board. The Park Board proposed a new building adjacent to the Roundhouse, which became a reality in August 1997. 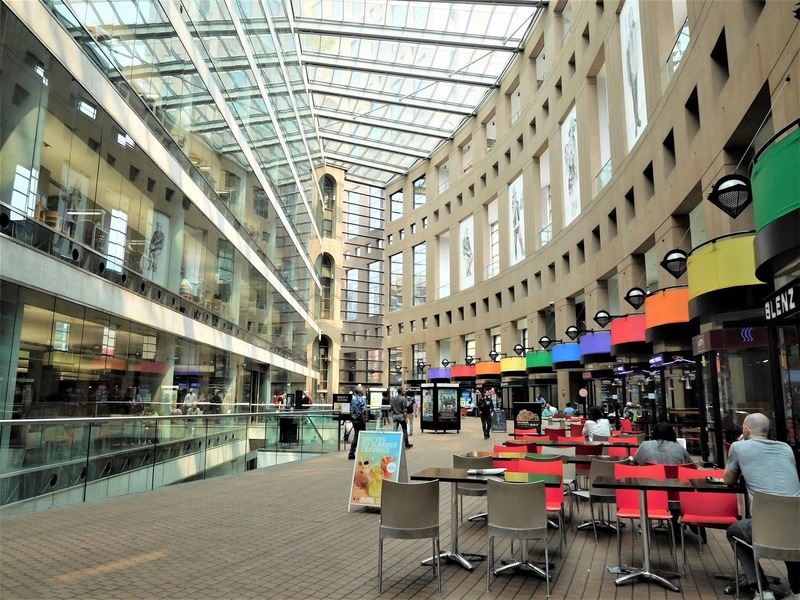 Like many other visitors, we didn’t want to miss walking Robson Street with its upscale boutiques, hotels and restaurants. The heart of the city, Robson Street, includes the beautiful City Hall building, the Public Library, and the city satellite campus of the University of British Columbia. Robson Street runs the entire length through the main center of town, from the edge of Stanley Park to the southeast end of town at BC Place, which brings us back to False Creek. 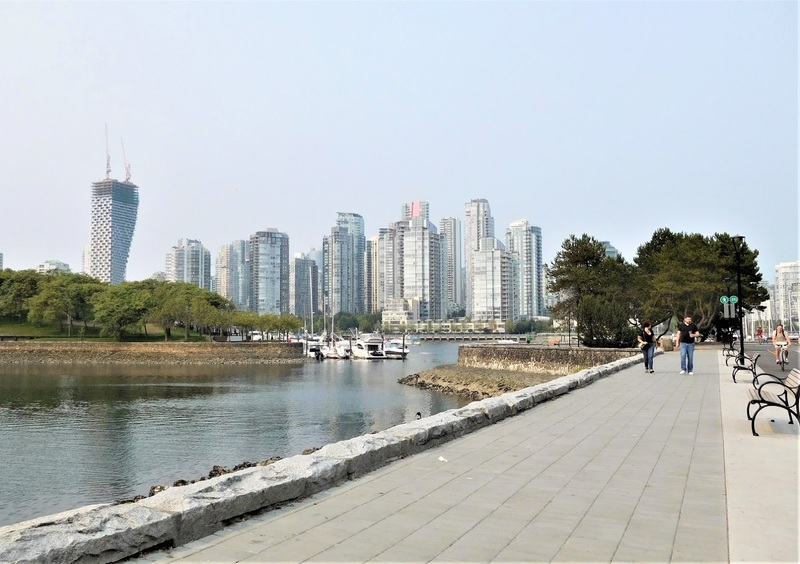 False Creek is home to the Plaza of Nations, which houses the Edgewater Casino, several night clubs, and offers an outdoor amphitheater for festivals, concerts, and other special events. Science World is found at the east end of False Creek, while Granville Island is located on the west end; water taxis leave every few minutes from numerous stops in the harbour of False Creek. 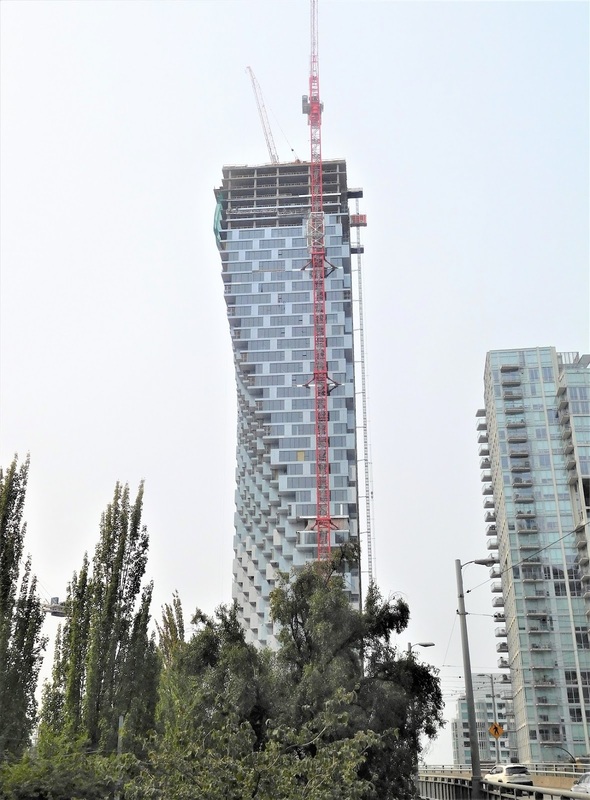 What’s not to like about Vancouver? Boaters have the luxury of staying in various marinas in town and can access public transportation for a day’s outing. Other areas worth mentioning are West Vancouver and North Vancouver, accessed via SeaBus at the Terminal located between Gastown and Coal Harbour. West Vancouver and North Vancouver are located on the north side of Burrard Inlet and offer three different snow ski areas and lookouts: Mt Seymour, Grouse Mountain (with a Skyride and Zipline), and Cypress Provincial Park; don’t forget to visit Capilano Park near Grouse Mountain with its foot suspension bridge and tree-top boardwalks. 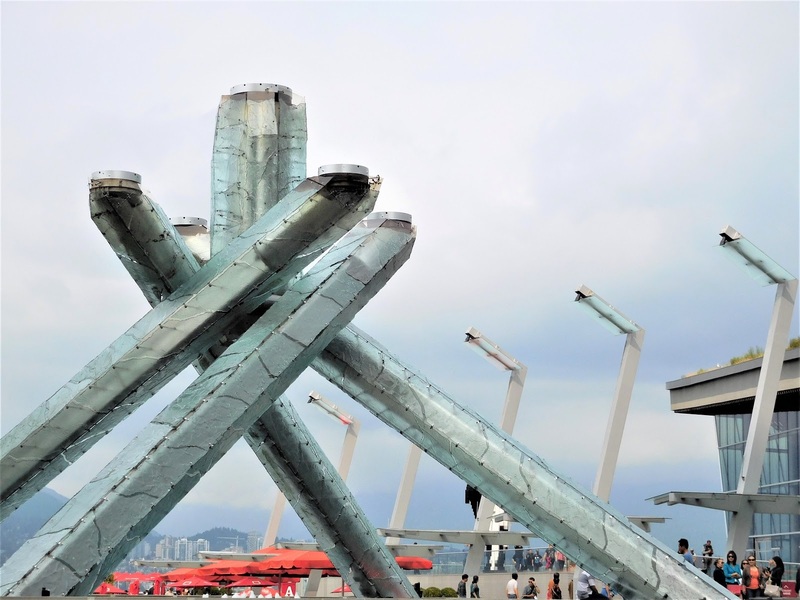 The world-class city of Vancouver BC is worth spending several days if not weeks or months, we’re sure you’ll fall in love with the city as we have. 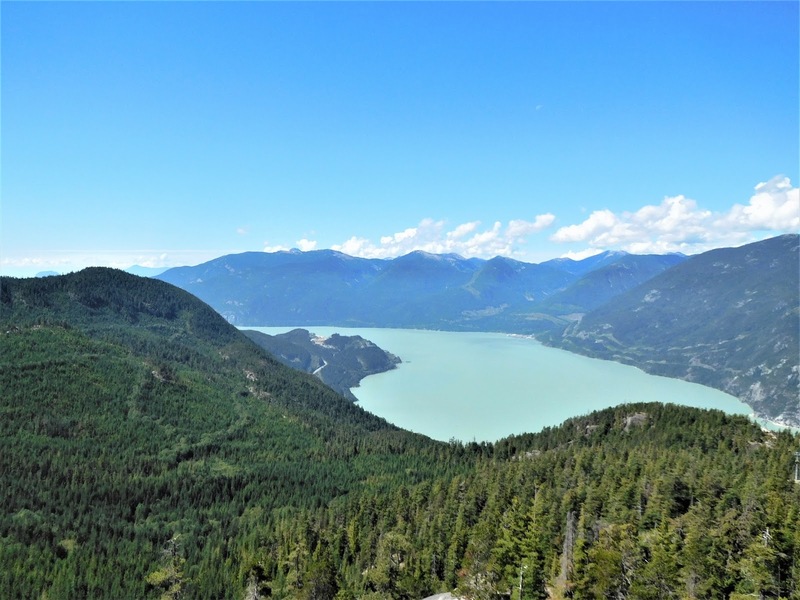 Howe Sound is incredibly beautiful, it's no wonder that this area was selected when shooting scenes for the movie Double Jeopardy; the majestic mountains and emerald green waters are the perfect background for sailing and ferry boat scenes. Our clockwise exploration of Howe Sound, starting from Gibsons, took us up the west side to Squamish (see previous blog post about Squamish), and back south down the east side of the Sound. 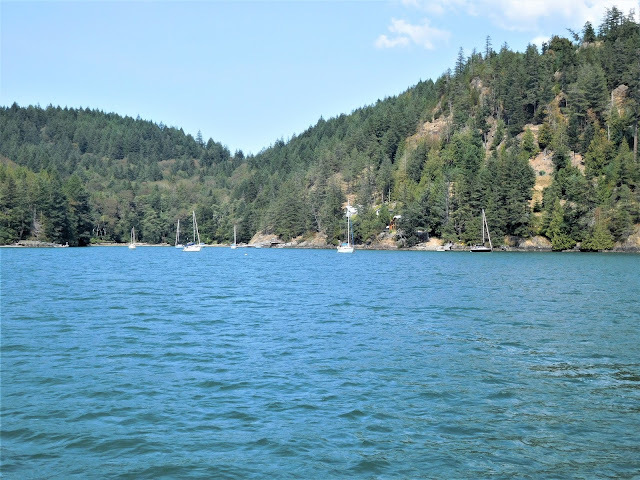 There are several anchorages within the Sound, a few small marine parks, and even a Provincially designated site for burial of ashes at sea, called Mariners’ Rest. 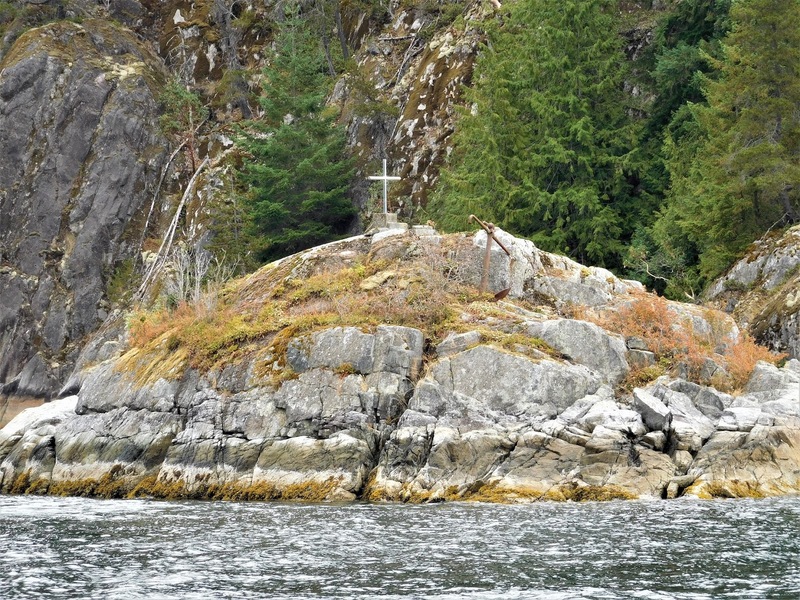 Look for the stainless-steel cross on a rock islet off the west coast of Gambier Island in Thornbrough Channel. Mariners’ Rest is dedicated to the remembrance of mariners, who have passed on; the “Mission to Seafarers” serves as custodian. The burial at sea of ashes are conducted offshore, not on the island; no one may go ashore or add anything to the islet. The "Mission to Seafarers" provides help and emotional support to captains and crew in over 200 ports around the world, including providing welfare and spiritual support services. The year 2006, marked the 150th anniversary of ministry to seafarers, and a special memorial service was held at Mariners’ Rest in Howe Sound. Most of Howe Sound is too deep for anchoring, but there are enough places to drop the hook and enjoy the beautiful scenery. Anchorage can be found in the Defence Islands, on the north side of the 73 Meter Island depicted on charts. The two Defence Islands are IR (Indian Reserve) property. 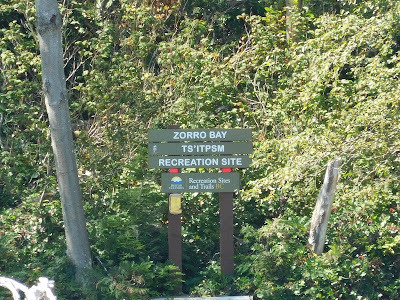 Further north, along the mainland, is the interesting bay of Zorro with ruins of a wharf, a nice beach and hiking trails. Anchoring depths vary depending on how far off shore you anchor or whether you use a stern-tie. 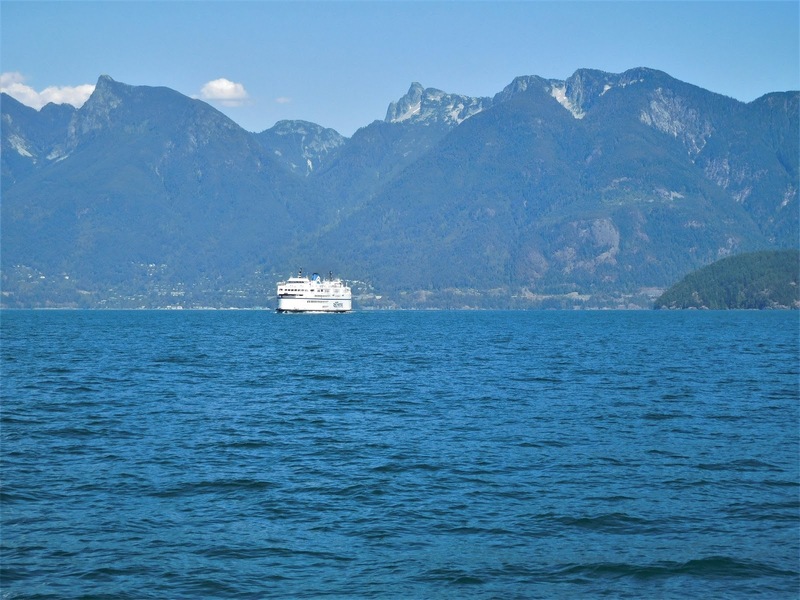 Boaters should be aware of the change of outflow and inflow winds when anchoring in Howe Sound. 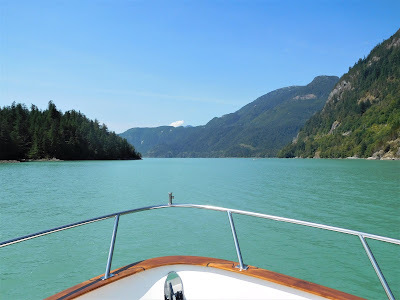 Heading back south along Montagu Channel, on the east side of Howe Sound, boaters can stop at lovely Porteau Cove Marine Park which has one mooring buoy and a 60-foot float (not connected to land). Two “shallow water buoys” near the float mark shallow areas. A self-registration, payment box is located on the float. Access to land is via dinghy, kayak or a short swim. 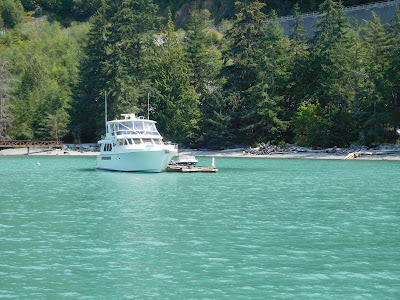 When approaching Porteau Cove, stay clear of the scuba diving area marked with yellow buoys. Sunken ships and man-made reefs provide scuba divers an excellent site for exploration. Anchoring within the park is prohibited. 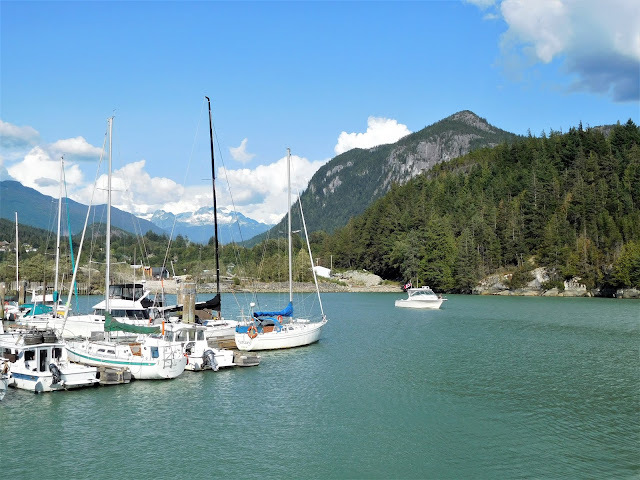 Anchorage can be found on the south side of Gambier Island, across the channel from Porteau Cove in Halkett Bay and Port Graves. Halkett Bay has one mooring buoy, labeled B.C. 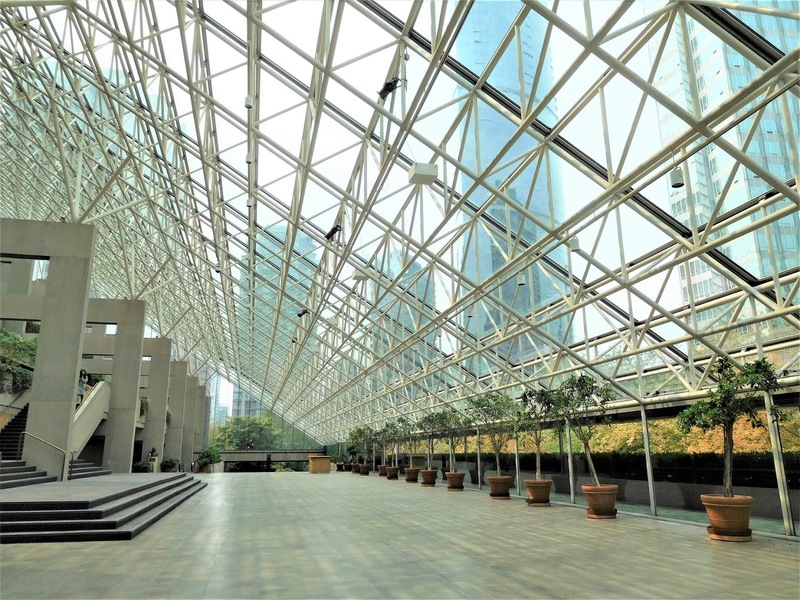 Parks, and 5 stern-ties recently installed this year by B.C. Parks. A dinghy dock provides access to Halkett Bay Marine Park, which has three camp sites and hiking trails. 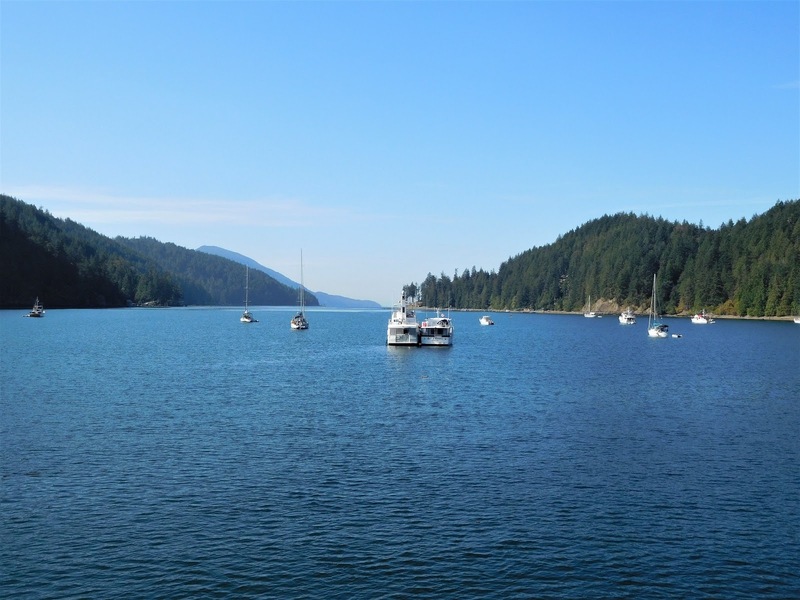 Port Graves, the next bay to the west on Gambier Island, has ample room for a large number of boats to anchor. Here, we met up with friends, Knut and Christine, and rafted together in the bay. 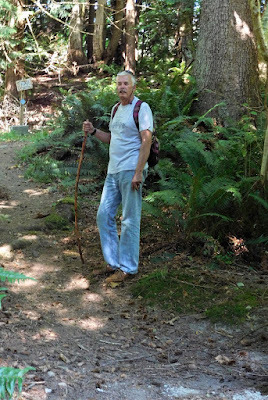 We caught up on cruising stories, and hiked the onshore trail towards Lost Lake. The lake remains lost, since we walked only about half way when it was time to turn back. 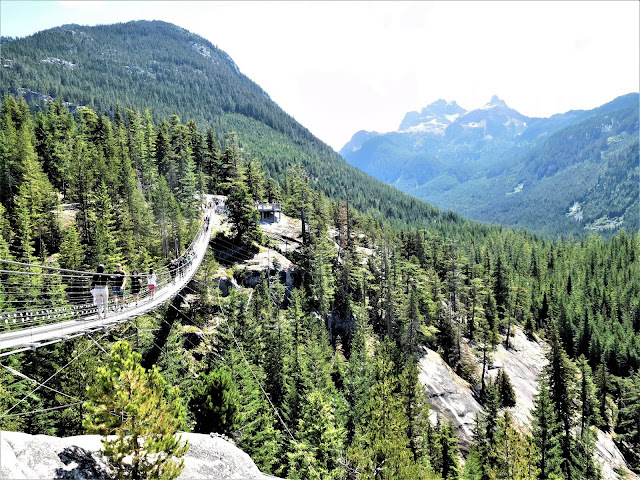 The trail to Lost Lake is approximately 2 ½ miles with switchbacks through the trees and ferns, and bridges that cross over creek beds. Port Graves is a nice place to spend time hiking and relaxing with friends. A public wharf and float at the head of the harbour can be used for dinghies; the marked yellow side-tie space is reserved for the water taxi. The adjacent floats belong to a Christian camp. 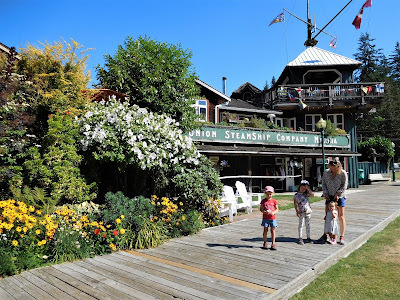 From Port Graves, we motored to Snug Cove on the east side of Bowen Island and had a pleasant stay at Union Steamship Marina. 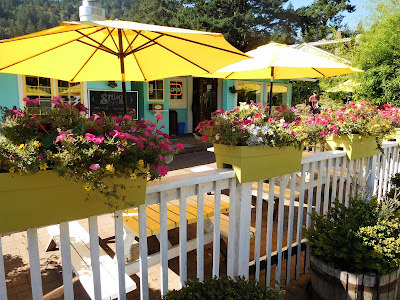 Like Gibsons, Snug Cove in the southern area of Howe Sound, is a popular destination, and reservations are highly recommended. Snug Cove is absolutely adorable, with attractive buildings, boardwalks and nice boutiques. 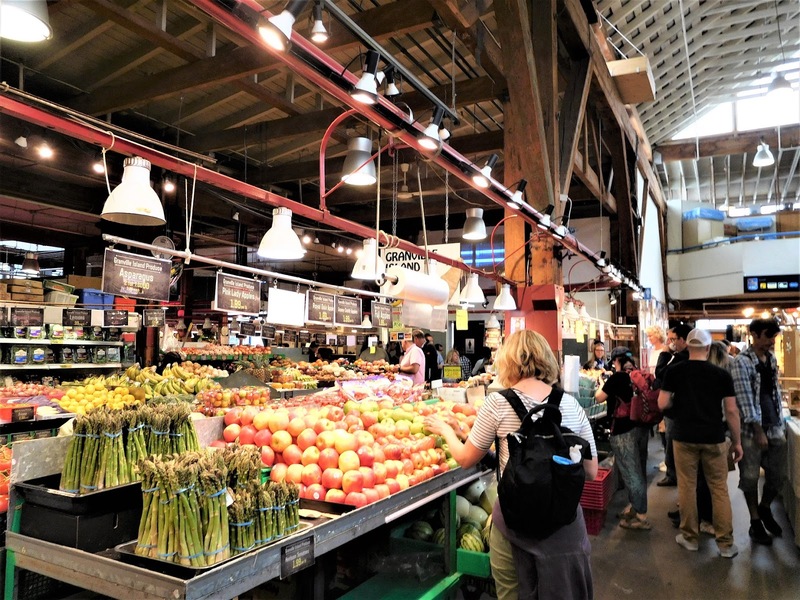 There are two well stocked markets and a nice selection of good cafes. A new pub near the market store was recently completed, and the Copper Spirit Distillery is currently under construction, just upland from the marina. 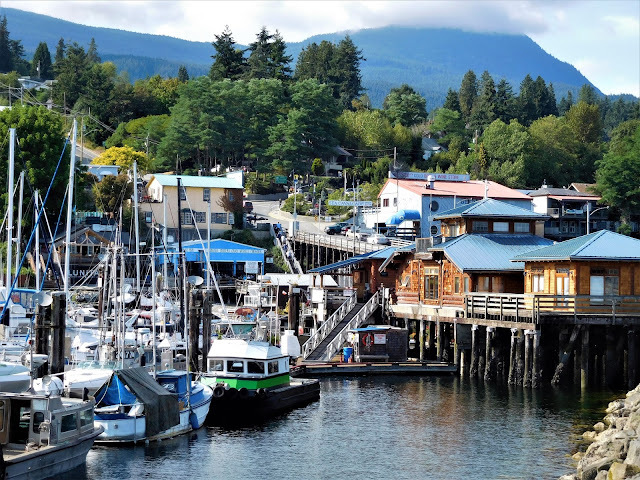 Additional shops and eateries are found at the adjacent Snug Cove Public Wharf, which offers short-term and overnight transient moorage. If you’re willing to hike up a steep gravel trail and paved drive, you will come to Artisans Square above the main village. Artisans Square has several nice art galleries, a couple of cafes, and a chocolate shop. Don’t miss visiting the Cashmere store, where elegant pieces are made and sold in-house. Snug Cove, within close proximity of Vancouver, has recently begun to receive fly-in dinner guests via float plane. The marina is also seeing the trend of larger yachts arriving at their docks. 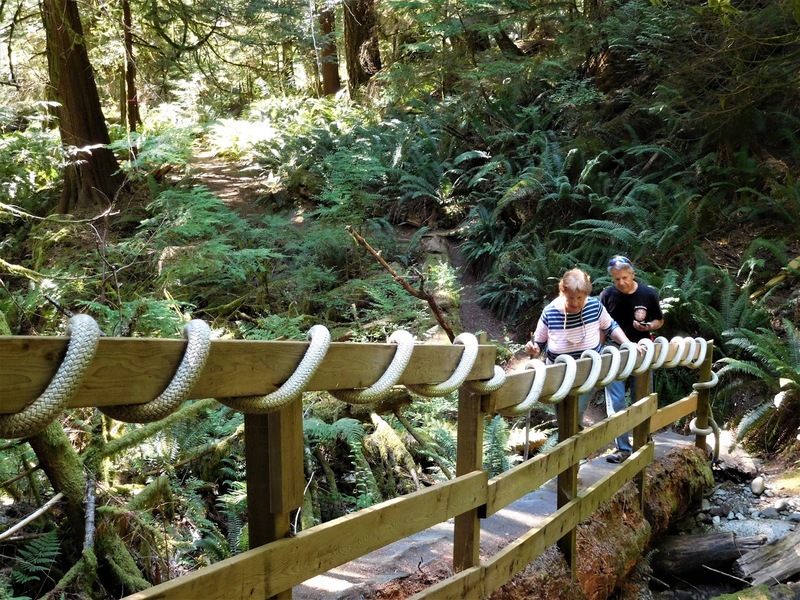 Snug Cove is definitely a fun place to be and has just about everything a boater could want, including parks and hiking trails. You can pick up a trail map at the village visitor center, located near the library. Gibsons is a great jumping off point for exploring Howe Sound. 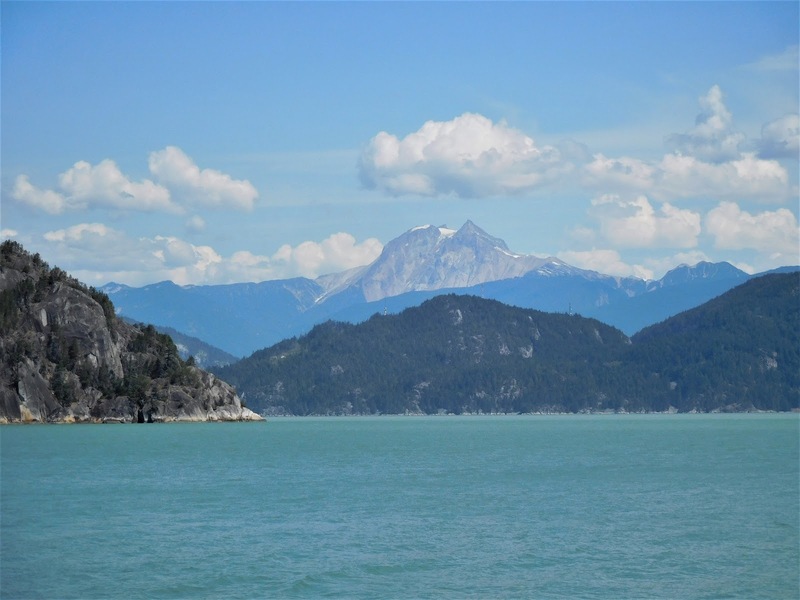 Most boaters stay in the southern reaches of Howe Sound, namely Gibsons; Snug Cove on Bowen Island; and the anchorages on the south side of Gambier Island. Very few pleasure boaters venture through the emerald green waters further north, and even fewer go to Squamish at the head of Howe Sound, and that’s a shame. 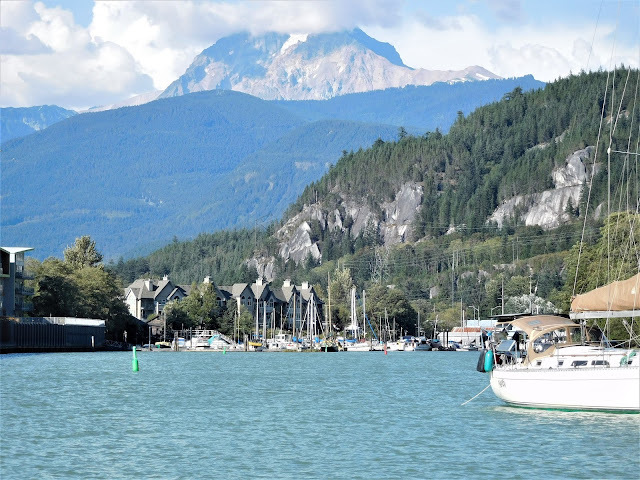 Like us, some boaters may remember Squamish as a quiet, sleepy town with little to offer from a boater's perspective. When we arrived at Squamish, the town we remembered couldn’t be found; it had disappeared and something new has taken its place. 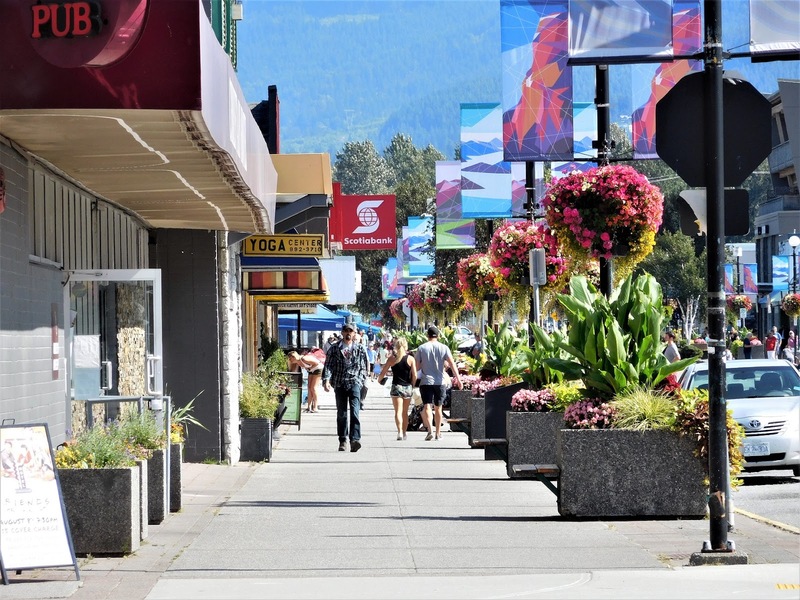 This vibrant, active town filled with young people and young families, is now the place to be. 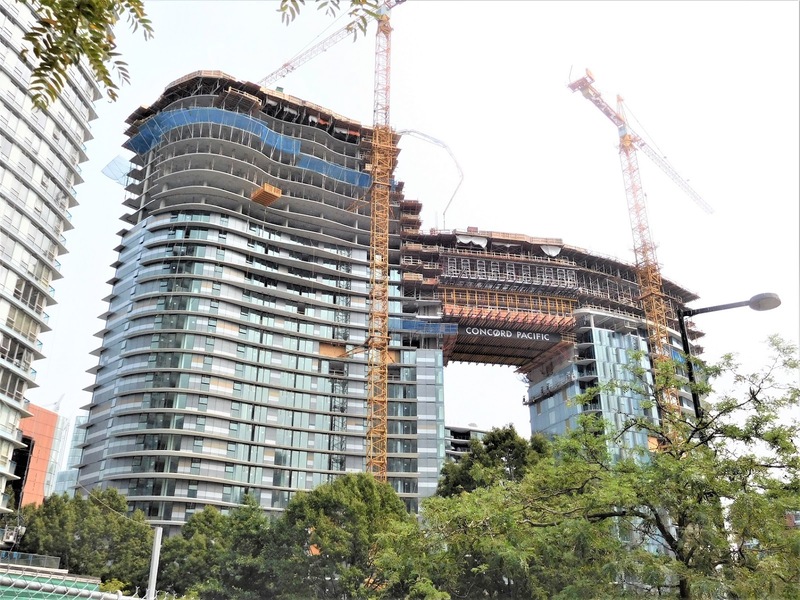 Condos have sprung up all along the waterway where the marinas are located, and more apartments and condos are currently under construction. 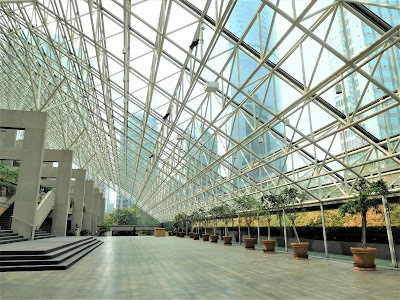 We shouldn’t be surprised that people are drawn to this beautiful location surrounded by majestic mountains, a place that offers many outdoor activities: rock climbing, mountain biking, snow skiing, and kite boarding, and numerous sport clubs. 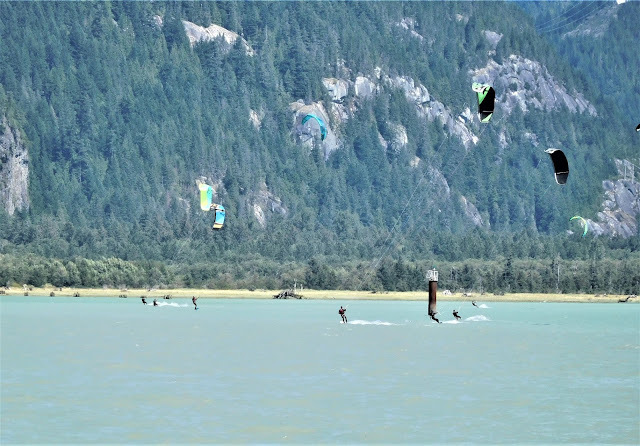 As we approached Mamquam Blind Channel, the boat entrance into Squamish, dozens of kite boarders were riding the winds off Squamish Spit. 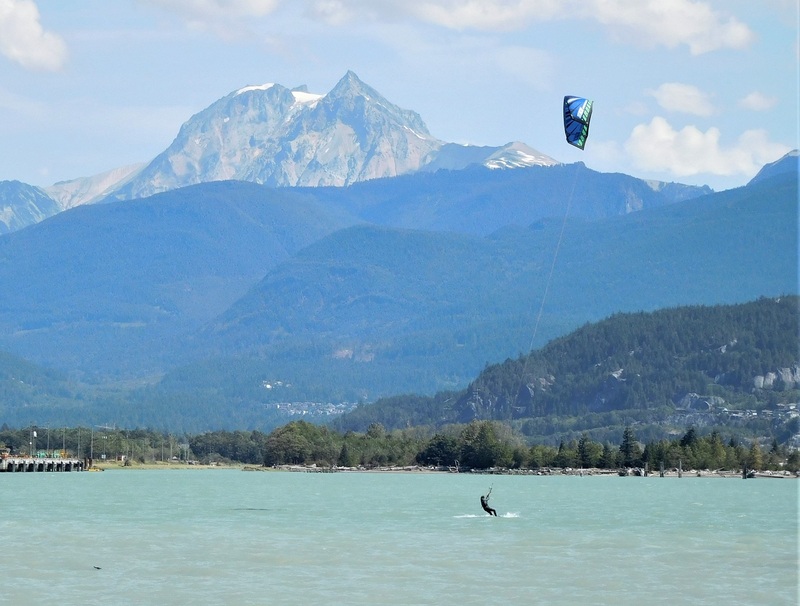 In fact, Canada’s largest kite boarding competition is held annually in Squamish. 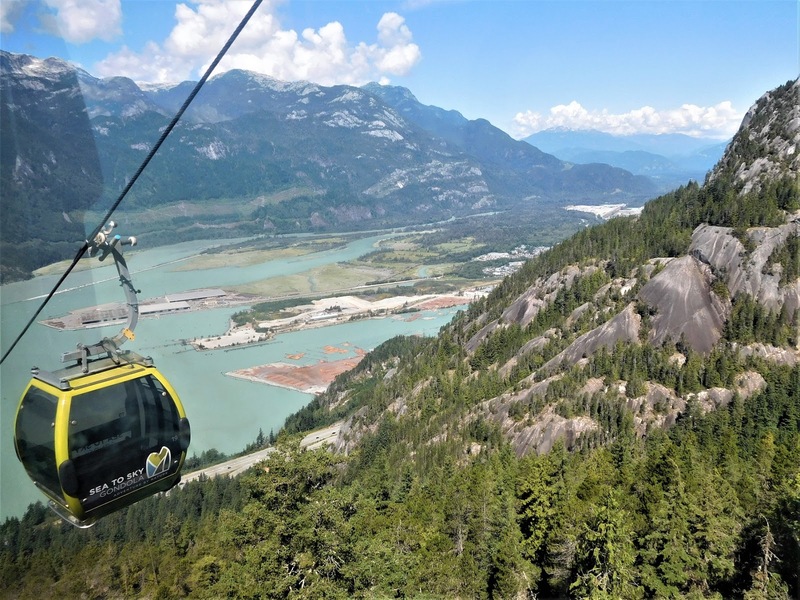 The world class Whistler-Blackcomb ski resort is a bus ride away; and the Sea to Sky Gondola, just 2 ½ miles from Squamish, can also be accessed by bus. 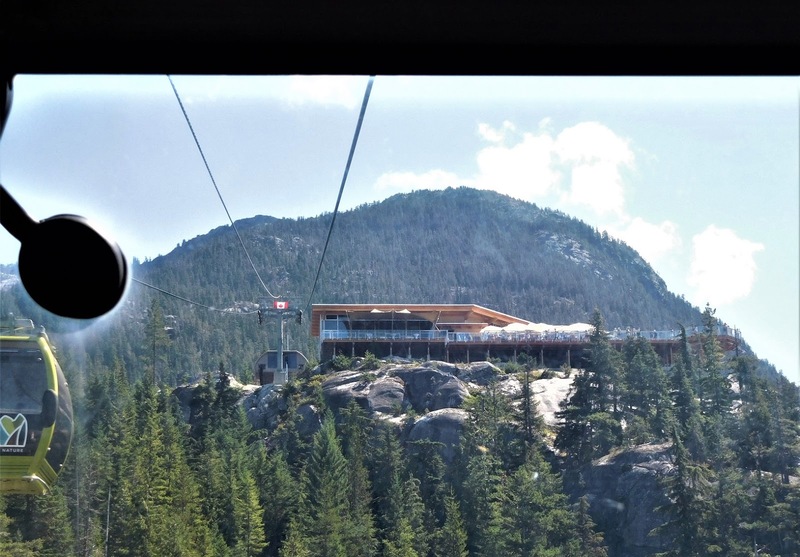 A ride on the Sea to Sky Gondola is not to be missed. The views from Summit Lodge are spectacular. The length of the gondola is 6,300 feet with a vertical rise of 2,790 feet; it takes 12 minutes to reach the top, where you are 2,900 feet above sea level. From the lodge, a suspension bridge crosses a canyon to another viewing platform. 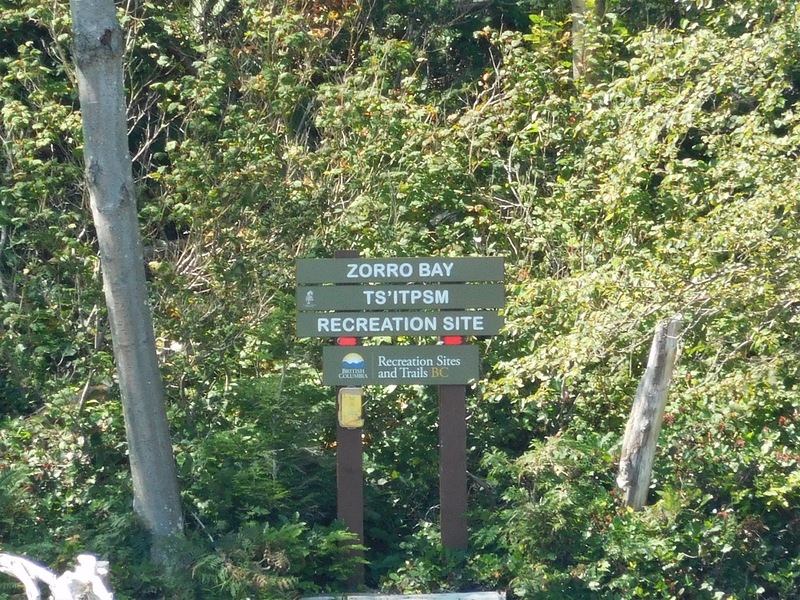 From here, visitors can hike several trails with viewpoints and interpretive signage along the way. The lodge offers food and drink, or you can purchase a picnic basket at the outdoor venue. It’s all very well done and very impressive. It is no wonder so many folks have moved to Squamish. The growing community hosts many festivals throughout the year and has an excellent Farmers Market. We also found that the pubs and restaurants have excellent food with the latest creative fare. 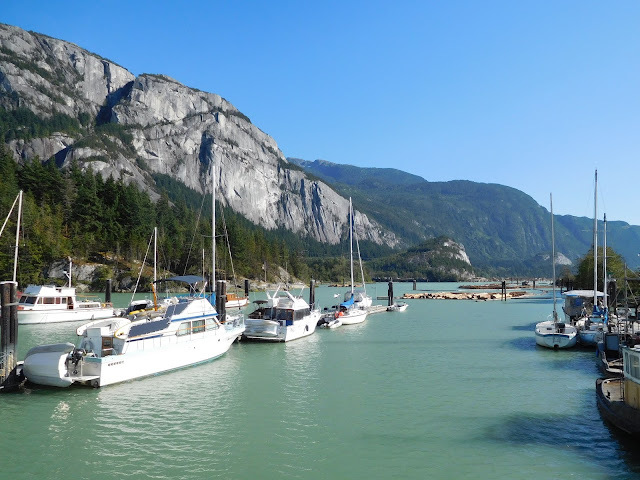 Boaters may find that entering Squamish can be a little challenging, but it’s worth the effort. Be sure to check the tides and call ahead for space. To access the docks at Squamish, boaters should enter Mamquam Blind Channel at mid-tide or high-tide. The channel has a lighted range. 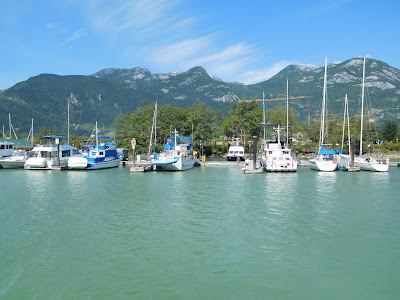 On entry, follow the yellow marked steel pilings, favoring the starboard side until abeam of Stawamus River, then favor the port (west) side of the channel through the charted quarter-mile shallow area, staying close to the piling painted green, white, green. After passing the shallow area, there are private red, green lateral buoys marking the channel. Boaters have two viable options for moorage, the Harbour Authority docks of Squamish, (604-892-3725) for vessels up to 55 feet, and the Squamish Yacht Club (604-815-9533) which accepts boaters from just about any yacht club. 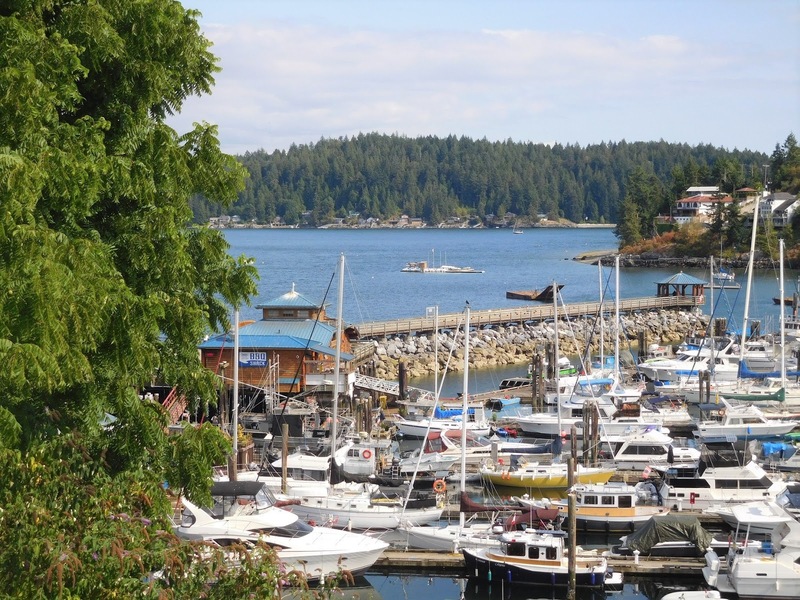 The marina and yacht club are located side by side, divided visually by the small Harbour Authority office building; yacht club docks are on the north end, Authority docks are south of the office building. 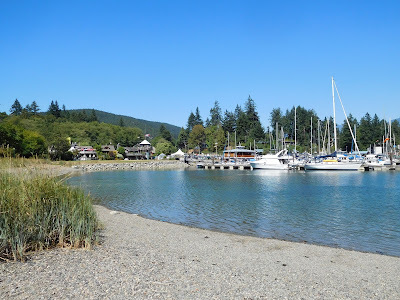 When we visited, we observed that a sailboat was anchored just north of the yacht club docks. Plans are in the works to add additional docks at the Harbour Authority facility, and we were told that a condo, marina facility is planned to go in across the channel. 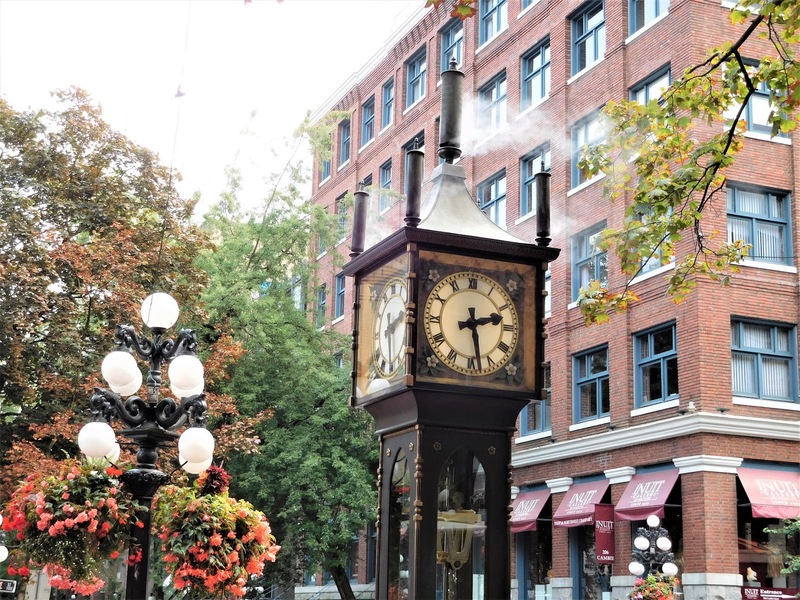 A short walk from the docks and you're in town where all the action is; the good pubs and eateries, and the Saturday Farmers Market held April through October. Next time you're in Howe Sound, consider visiting Squamish. 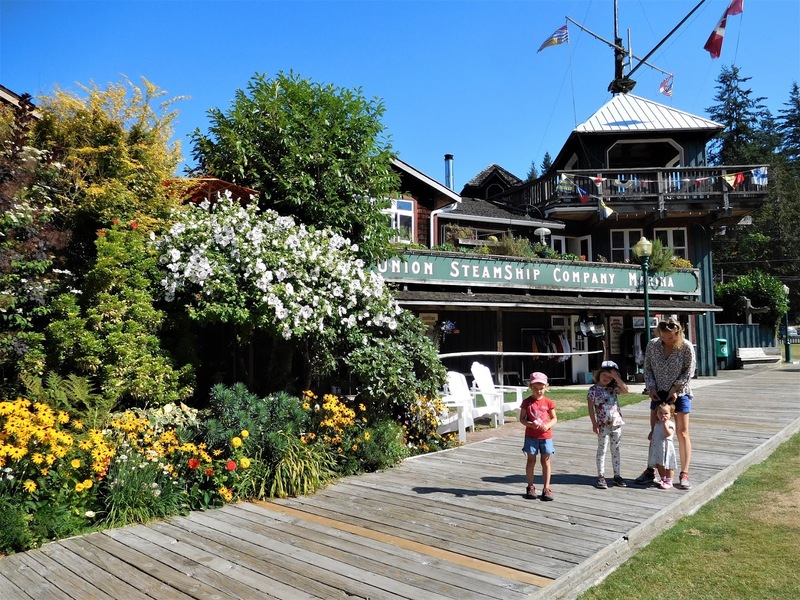 Visiting the town of Gibsons is like experiencing a colorful tapestry of boats, people, and cafes. 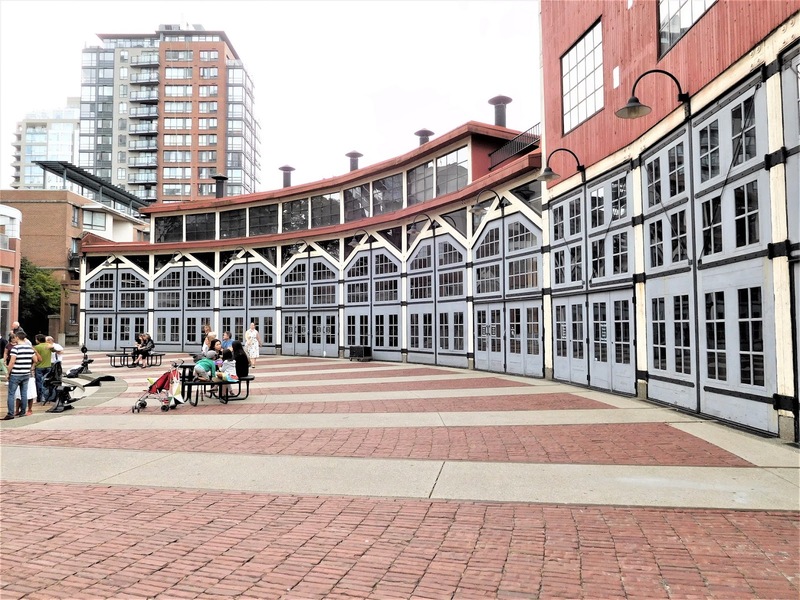 Lunitas Mexican, Molly’s Reach, Smitty’s Oyster House, and Smoke on the Water BBQ Shack are among some of the favorite eateries in the waterfront district. And of course, Mike’s Place Gelato shouldn’t be overlooked; the choice of flavors is among the best and the quality is excellent. 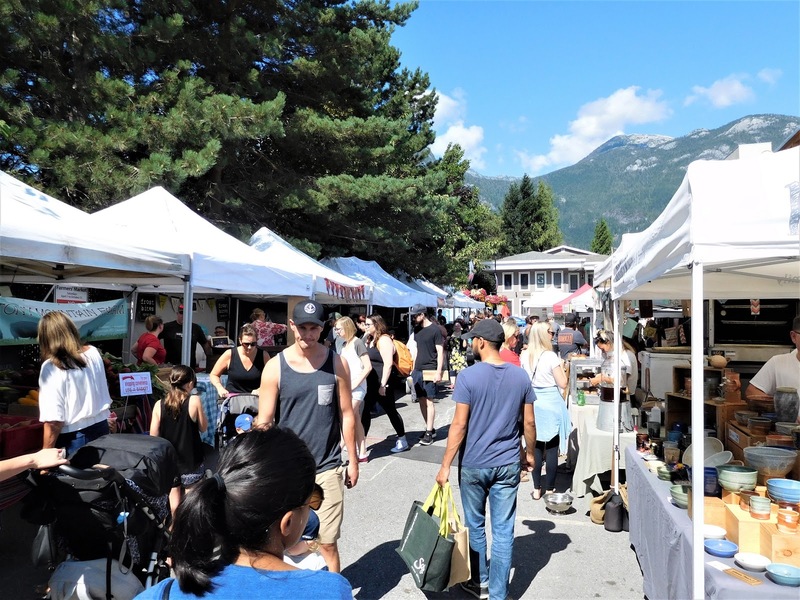 More food products, baked goods, and handcrafted products can be found at the Sunday Market, held at the public library and Town Hall parking lot from 10 am to 3 pm from May through September. 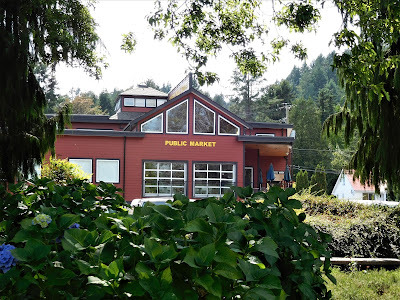 If you need groceries for the boat’s galley, Gibsons Public Market on Grower Point Road (upland from Gibsons Marina) has fresh fruit, produce, and quality meats; a touch-tank aquarium is located upstairs. 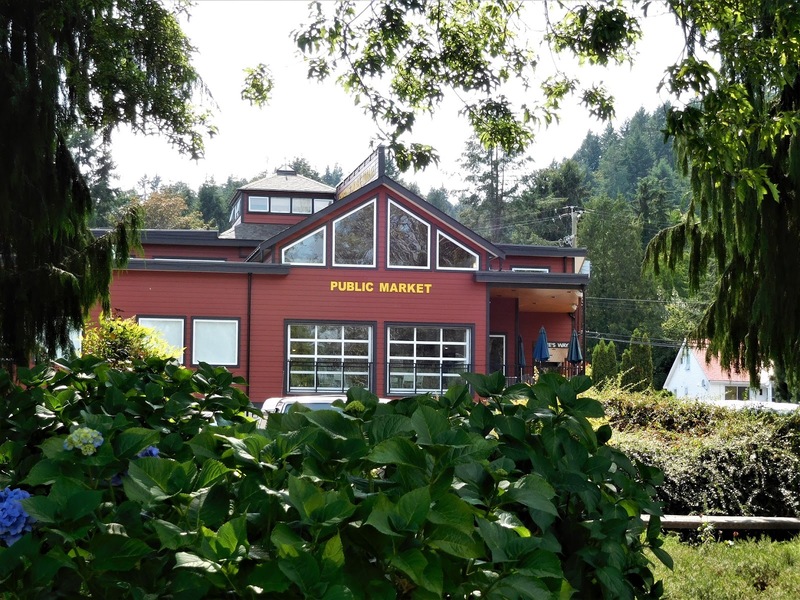 The Public Market is open year-round, Tuesday through Sunday. 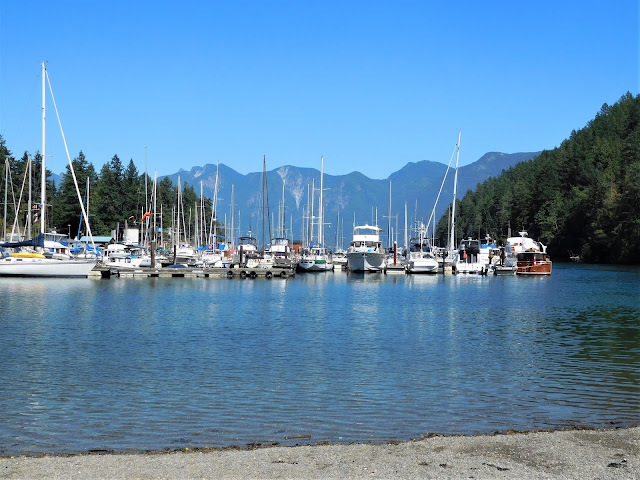 The variety of boats that come and go at Gibsons is also vibrant, with sport and commercial fish boats, sailboats, yachts and service boats that find their way in and out of the busy harbour entrance. Guest moorage at the Harbour Authority docks on the west side of the pier is first-come, first-serve, but you can call 30 minutes ahead to inquire about available space. 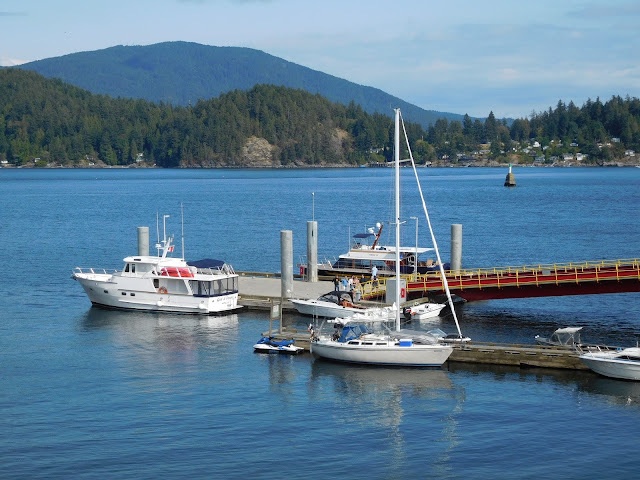 Reservations are accepted for boats over 45 feet, which are assigned to the concrete float located outside the harbour breakwater on the northeast side of the pier. 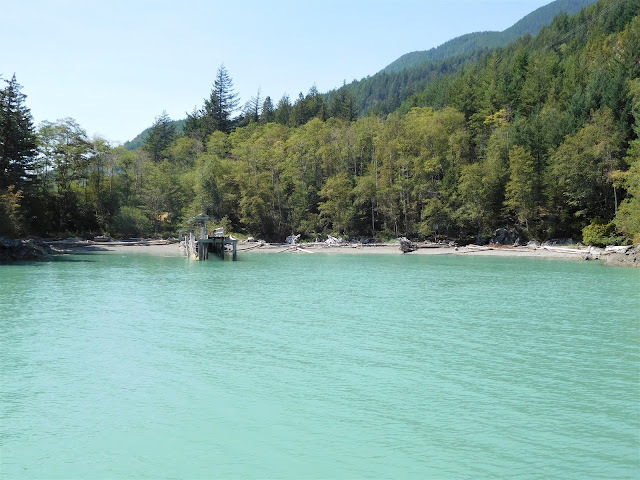 Power on the concrete float but no water at this time; plans are in the works to add an additional concrete float for large vessel moorage and provide water to the floats. Boaters can also call for reservations at Gibsons Marina, located on the south side of the Harbour Authority docks. Guest moorage is in unoccupied slips with a maximum boat length of 40 feet; larger vessels can be accommodated at a side-tie dock when space becomes available. 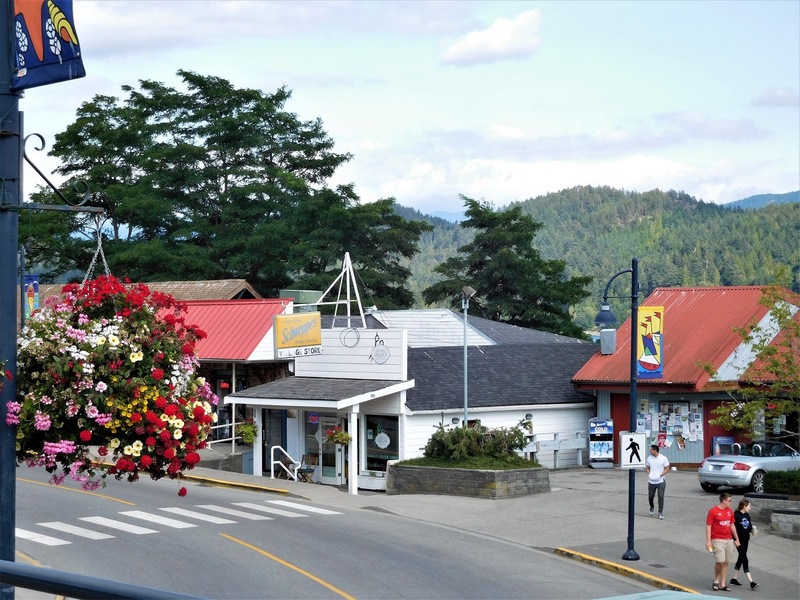 No longer a sleepy little town, big changes are coming to Gibsons. A hotel, condo complex, with associated docks, is slated to be constructed just south of Winegarden Waterfront Park. Demolition and clearing of the property has already begun. 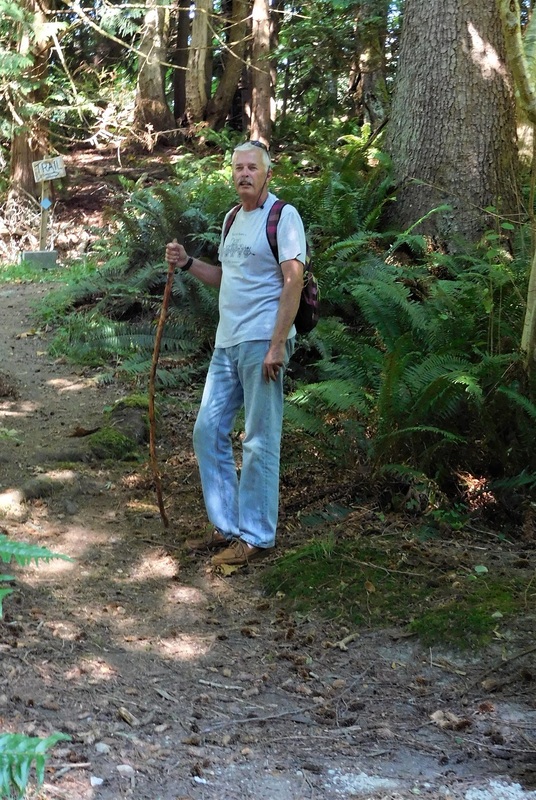 At this time, it is not known if the condo docks at the new “Gorge Complex” will include space for transient moorage. Growth is coming to town, and locals have mixed reactions; some welcome the change, while others want things to remain the same. 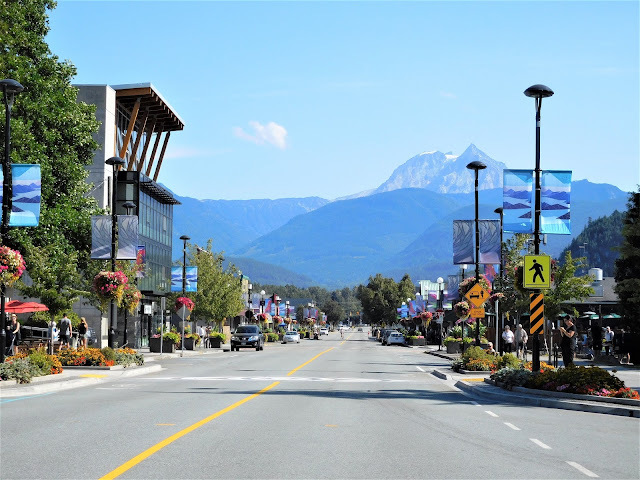 Like other towns near Vancouver B.C., Gibsons is seeing new money and new growth in the form of chic condos and a growing population. Like it or not, change is a fact of life and the tapestry continues to grow.